When my best mate Carlee and I decided to travel the United States of America together in 2012, we had our hearts set on road-tripping around the country – something I have always dreamed of doing. We talked for months about which places we wanted to visit, the things we could do and see, and how much fun it would be to have the spontaneity of driving wherever we pleased. Then, we priced hire cars. Since we were both under the age of 25, it was ridiculously expensive to hire a car. Insurance alone was almost twice as much as the actual hire price of the car for a few weeks, and it just wasn’t within our budget to pay it. Disappointed, we started to look into other options, and that’s when we discovered Megabus. 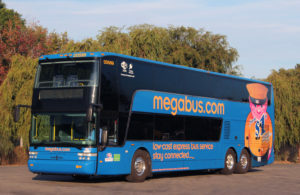 Megabus is a low-cost express bus service in North America and Europe, offering incredibly low fares – some as little as $1 each way. We could hardly believe the prices when we started looking into it, and decided that bus travel would have to be the way to go. 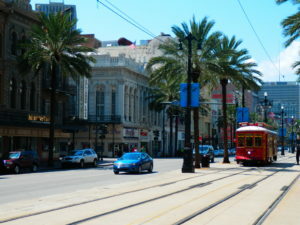 Starting in Chicago and ending in Orlando, we travelled to St Louis, Memphis, Dallas, Austin, Houston, New Orleans and Montgomery for just $85 AUD each. That’s right, $85 AUD per person to travel over 4,000km. Sitting in a hostel in Chicago, the day before we left on the first leg of our bus trip, Carlee and I were enjoying a few cold beers with some fellow Aussies, watching the London 2012 Olympics. Standard hostel chitchat led us to tell our new friends that we were headed to St Louis, MO the next morning aboard the insanely cheap Megabus. Bragging about what a great bargain we scored, we went on to tell them our plans travelling by bus through the southern states over the next couple of weeks. “Megabus? Have you guys seen the news lately?” one of them asked. Shaking our heads, he went on to explain that there had been some not so comforting news about the Megabus. Over the past few years, there had been some incidents involving the bus company; a bus was pulled over in 2008 due to excess speed and swaying, only for the police to find the bus driver intoxicated; a bus en route to Toronto missed an exit near Syracuse, NY and crashed into a railway overpass killing four people; and most terrifyingly, a bus bound for St Louis, MO slammed into a concrete bridge pillar, killing one person – this happened not only on the same route we were travelling the following day, but also only a week earlier. Needless to say, we were a bit uneasy about the next couple of weeks of travel, but decided to stick to our guns, pray we’d survive our $85 bus journey across the country and we swore we wouldn’t tell our parents about the Megabus track record until after we’d arrived safely in Orlando, FL. The next day, when we arrived at the Megabus depot in Chicago, we felt a bit nervous about getting on the bus and potentially risking our lives to save a buck. However, once we boarded, we found the bus to be clean and comfortable, complete with free Wi-Fi and power outlets at every seat. Obviously, we survived the journey, but I would recommend doing your research before booking your travel (not just bus travel, but all travel) to ensure that you are choosing a safe, reliable mode of transport. We were lucky, and to be honest, I don’t think that reading the news articles beforehand would have deterred us entirely, considering how cheap the fares were. After breathing an enormous sigh of relief upon our safe arrival into St Louis, Carlee and I made our way to the Huckleberry Finn Youth Hostel, which is located in the historic Soulard neighbourhood. When we arrived, we realised that this hostel, much like the entire city of St Louis itself, was very old and quiet, unlike many of the other hostels we’d experienced on our trip. We counted a total of nine cats living in the hostel, which is about eight cats too many for a normal hostel (and I’m a cat lover!) The lack of atmosphere meant that we made ourselves at home at the bar across the road – the lovely Nadine’s Gin Joint. A classic Mid-Western style bar, Nadine’s served well as our home away from the hostel, and with cheap drinks and good food, what more can you wish for? We went to the bar both nights spent in the city, and became firm friends with the owners/bartenders; a friendly gay couple named Todd & Don, who both loved our Australian accents and were more than happy to give us free beers! If you’re ever in St Louis, you absolutely need to go and check it out. We only had one full day to explore St Louis, which was probably more than enough. We wandered the short mile from our hostel into the centre of the city, and headed straight to the Gateway Arch, arguably the most iconic monument in the state. Known as the world’s tallest arch, the Gateway Monument offers some incredible views over the city and river from the observation area at the top. After enjoying a delicious lunch at an Irish pub and getting terribly lost on the way back to our hostel, we decided to spend the afternoon at the nearby Anheuser-Busch Brewery, more commonly known as the home of Budweiser. The brewery offers a free tour, which is both interesting and educational, before inviting you into their tasting room, where you’re given the chance to sample their products – all without paying a cent! Plenty of samples and little bags of pretzels later, Carlee & I stumbled down the road back to Nadine’s for a last hurrah before our bus to Memphis the next day. The trip to Memphis was pretty forgettable, and when we arrived in the Birthplace of Rock & Roll, it was absolutely pouring rain; like someone had turned on a shower in the sky. We had gotten a taxi from the bus station to our accommodation at the Pilgrim House Hostel, and when we got out of the car we realised we couldn’t actually see the entrance. 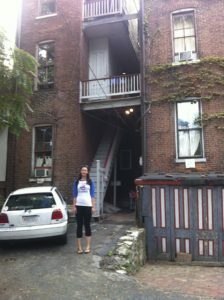 There we were, standing with all of our belongings in what felt like a monsoon, and we couldn’t find the front door. Running back and forth around the large building, we eventually found a tiny sign which led us in the right direction. Soaking wet, we proceeded to check in, and discovered that the Pilgrim House Hostel wasn’t like other hostels in that each guest is assigned a daily chore for the duration of their stay. The hostel had a very different vibe to the other hostels we’d experienced during our trip; it was very quiet, and the building itself was part of a church. We only stayed for a couple of nights, and we were pretty glad to leave as there was absolutely no atmosphere! 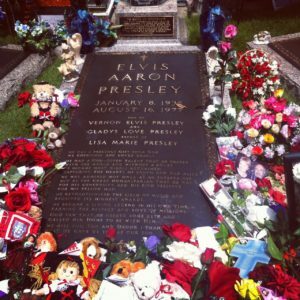 Given we only had one day to explore Memphis, we ventured straight to the famous Graceland – home of Elvis Presley. We happened to be there on the 35th anniversary of the King of Pop’s death, so Graceland was absolutely packed with diehard Elvis supporters, which definitely made the experience more interesting! I found his home to be quite modest for such a huge celebrity, but when you put it in perspective, it would’ve been more impressive back in the day. It was a strange feeling wandering around the home of Elvis, but it was full of history and we found it to be very interesting, even though we aren’t diehard Elvis fans! We also visited the National Civil Rights Museum, located in downtown Memphis. 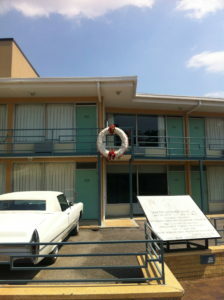 The historic museum is built around the former Lorraine Motel, where Martin Luther King Jr was assassinated in 1968. Prior to visiting the museum, both Carlee and I had limited knowledge about the civil rights movement, and were interested in learning more. Over the few hours we spent there, we moved through a range of different emotions, starting with shock, then moving onto disbelief, horror, anger, and finally ending with sadness. The civil rights story is told in an engaging, interactive that allows you to fully absorb the history. If you’re ever in Memphis, I would strongly recommend a visit here, as it is truly a humbling learning experience. Finally, we just had to check out Beale Street in downtown Memphis. Known as the most iconic street in the entire United States, Beale Street is packed full of bars and restaurants that celebrate the city’s music culture. There are plenty of live musicians, incredible southern food, and more beer than you could ever drink! We found Memphis to be a pretty laid back city full of things to do & see, and full of all kinds of interesting history. The next stop on ‘Court & Carlee’s 2012 Bus Tour Across America’ was the Lone Star State – Texas! When we arrived in Dallas, TX, we realised that the bus stop was located in the middle of nowhere (basically in the outskirts of the city), and there were absolutely no taxis nearby, nor were there any public buses or trains. Luckily, we had already made friends with a darling pair of older ladies who had ridden the bus to Memphis and back, about four hours each way, purely because they wanted to go on a trip (bless). When we arrived in Dallas, they kindly offered to give us a lift to our hostel, which was lucky because it was quite a distance from the bus stop! The Wild, Wild West Dallas Irving Backpackers B&B (yes that is the actual name of the hostel) was a teeny, tiny little place located about 20 minutes out of downtown Dallas. We hadn’t really planned to go to Dallas, but some of the Megabus routes only ran between certain cities, meaning we had to go via stopover cities in order to get around, and Dallas was one of these. We’re so glad we went there though, because that’s where we met Cam, one of our favourite travel buddies. Cam was a solo traveller from Western Australia, and after bonding over some instant ramen, we discovered that our itineraries for the next couple of weeks were almost identical. He had to leave the day after we arrived, but we made plans to meet up in Austin, the next city on both our itineraries. Apart from meeting Cam, we didn’t do anything too memorable in Dallas! Arriving in Austin, we were super excited to explore the state capital of Texas. After leaving the trusty old Megabus, we made our way to the HI Austin – our hostel for the next few days. Walking into the hostel, we saw a sign that made us cry a little on the inside – ‘Alcohol consumption inside the hostel is prohibited’. Luckily, we soon discovered that while you weren’t permitted to drink inside the hostel, you were more than welcome to drink outside. Phew! We made our way to reception, and discovered that our reservation had been lost, which is definitely not something you want to hear when the hostel has been booked out for the night! The hostel staff were really apologetic, and offered us the common room as our sleeping quarters for the evening. They closed it off at 7pm, set up a portable bunk bed and we had the entire place to ourselves until a couple of beds became available the following day, which was awesome! Austin had such a cool vibe, and the city itself was really fun to explore. Carlee and I met up with Cam, who had already made a few friend of his own, giving us a good group to explore the city with. One of the most memorable moments from our time in Austin was our night out. We started out by drinking beers on the deck outside the hostel. It was perfect – the sun was setting, giving off a golden glow across the lake. Our beers were cold, the air was warm, and life was good. Too good, it would seem, as Mother Nature decided to throw a spanner in the works and thought that a thunderstorm would be a great addition to our already perfect evening. As the deck was uncovered, we ran inside to seek shelter. Despite the fact that it was impossible to continue drinking our beers outside in the rain, we still weren’t allowed to consume alcohol within the walls of the hostel. Our solution? Stand underneath the front door’s tiny awning, and continue drinking! Unfortunately, I don’t remember much else from that night (possibly due to the number of beers consumed) but I do remember it being lots of fun! We went to a bar in downtown Austin and had a grand old time. God, I love Texas. 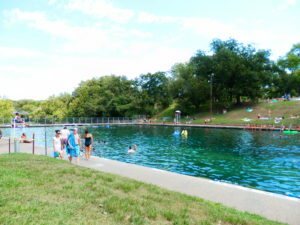 The next day, Carlee & I went exploring on our own, and found ourselves at Barton Springs Pool, and we couldn’t have been happier! Nursing pretty severe hangovers, the cool natural spring water was more refreshing than ever, and the surrounding park made us feel as though we weren’t in the city at all. It was the perfect way to end our few days in Austin, and I know that I’ll definitely be back one day! Next up on the bus tour was Houston, TX. As another stopover city, we hadn’t originally planned to visit Houston, and I wish we didn’t have to. 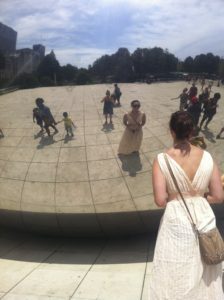 Now, I’m sure there are people out there who have spent time in the city and absolutely loved it, but sadly we did not. From the moment we arrived at the bus stop, we felt uneasy about the city. We stopped in at the McDonalds next to the bus station and were promptly harassed by some older men, who may or may not have been homeless. One tried to propose to me, and despite his tempting offer, I found the experience more unnerving than amusing. After grabbing a quick bite, we made our way to our hostel – the HI-Houston Morty Rich Hostel. Now, as much as we didn’t enjoy the city itself, this hostel was the best one we stayed at during the entire trip. Located in the Montrose neighbourhood, the hostel used to be a posh, historic mansion, complete with a pool. We were more than happy that the hostel was as amazing as it was, because we didn’t feel comfortable venturing too far into the city on our own. While we spent a lot of time at the hostel during our time in Houston, we did have one really great experience. We met a couple of girls in the hostel kitchen one day while we were making lunch. As fellow Australian travellers, we got chatting and they told us that they were headed to the Miller Outdoor Theatre, located about 15 minute walk away in the nearby Hermann Park. Entry was free, and the Breakfast Club was screening so we were more than happy to tag along when they invited us to join them. Despite our earlier experiences in Houston, I’m glad we had at least one happy, warm memory to take with us once we left. Oh, New Orleans. It would have to be one of my absolute favourite cities in the entire country. We arrived in New Orleans, happy to have left Houston, and excited to explore the vibrant, eclectic city. Our mate Cam had already arrived at the India House Hostel, a funky little place with incredible atmosphere – just what you need from a hostel. Oh, and it only had one cat, so that felt pretty normal too! After meeting up with Cam, we decided to venture downtown to explore. 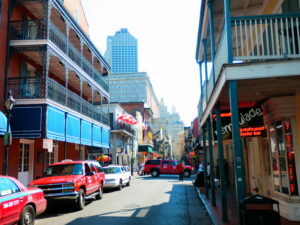 After jumping on a cable car, we made our way towards Bourbon Street – the heart of New Orleans. We found a bar that had a 3-for-1 special on beers, so obviously we decided to stop in. We grabbed ourselves a round, and then the rains came. Pouring heavily, we realised we weren’t going anywhere for a while. Not ones to be disheartened, we grabbed some more cheap beers and continued drinking until it was safe to leave, which was definitely more than a few drinks later. Tipsily, we wandered back to the hostel for some dinner and more beer before heading back to Bourbon Street for what would be one of the most memorable nights of my life. Upon our return to Bourbon Street after sundown, we found ourselves in a really cool, tiny jazz bar. After grabbing a drink, we made our way to a table and sat down to enjoy the music. The band was so funky, and we had a great time just sitting there and watching them perform. We decided that the next day, we wanted to go to an op-shop (or thrift store, as the Americans call them) to buy clothes from the 1920’s Jazz era, then go back to the little bar the following night to get really drunk and pretend we’d gone back in time. After we left the jazz bar, we found ourselves wandering through the French Quarter when we decided to head into one of the nearest bars. Lo and behold, a group of fellow Aussie travellers that we’d previously met and hung out with in Austin, TX were casually hanging out inside. Honestly, what are the chances? We knew they were in New Orleans at the time, but we had no idea they’d be at that particular bar, nor did we exchange phone numbers to organise a meet up. The universe is a funny thing! It turned out that they’d been staying at the hotel attached to the bar, and had been drinking there every day since they’d arrived. This meant that they were good mates with the bartenders, which meant that we were now good mates with the bartenders, which meant free beers! Woo! The free beers were excellent, and after we’d had enough we ventured to the nearest IHOP for a delicious drunken feed, before stumbling back to the hostel around 6am. It was a big night. I woke up the next day around 1pm, and begun what I believe is the second worst hangover I have ever had in my entire life. Head spinning, I got out of bed and made my way downstairs to see the others, who were feeling rough but definitely not as rough as me! Apparently we still had plans to go op-shopping, much to my dismay. All I wanted was to go back to bed, but I didn’t want to miss a day of exploring so I sucked it up and off we went. As the afternoon progressed, so did my hangover. I couldn’t eat when we went out to lunch (in fact, I threw up twice in the restaurant bathroom). We didn’t end up finding any Jazz clothes (not that I was in any state to start drinking again) so we headed home. We got on the bus, and it was a bumpy ride. I was scanning the interior for the nearest place to throw up, but luckily I held it in. We then had to jump on a cable car for the 5-minute trip back to the hostel, and it was packed. I started to get that feeling in the back of your throat and knew that it was coming. There was nowhere to run. I made it off the cable car with about three seconds to spare. It pulled up at our stop, I charged off and proceeded to bend over and throw up on the street outside our hostel. Classy. I then went to bed and slept for about 14 hours before we had to get our bus to Montgomery the next day. Worst hangover ever! Montgomery, AL was another stopover city, and considering we were only there for one night, we stayed at a tiny hotel near the bus station. There was basically no public transport from our hotel to the city, so instead of exploring Montgomery, we decided to hang out at the hotel (luckily, it had a pool) instead. There was literally nothing else to do! The best part about our very short stay in Montgomery was the discovery of Golden Corral. It was legitimately the highlight of our time there. If any of you reading this know Carlee or myself personally, you would also know that we are obsessed with buffets. All you can eat food is possibly the greatest thing ever, and when we found Golden Corral, we were the happiest people on earth. Anyone reading this who knows the buffet chain is probably thinking how crazy I am writing this, but we loved it! It reminded us of visiting your nanna’s house on a Sunday afternoon, with all the delicious, homely food on offer. Yes, I know, we are weirdos. 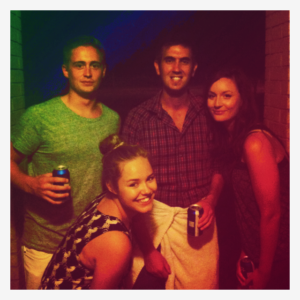 Apart from hanging by the pool and eating our body weight in buffet food, our time in Montgomery was quite uneventful. We recovered from New Orleans, then got ready for the longest leg of our bus tour – 17 hours from Montgomery to Orlando, FL. After our 17-hour bus journey, including a few hours stopover in Atlanta, GA for dinner at Hooters, we made it to Orlando. It was the most uncomfortable, long bus trip of my life, and I couldn’t have been happier to finally step off the Megabus for good! Carlee & I met up with Cam again in Orlando, and we had an epic few days introducing Cam to Golden Corral, and Universal Studios. The highlight of Orlando was easily going to the Wizarding World of Harry Potter, and we had the best day exploring the magical theme park! I’d been there before in 2010, but this was Carlee & Cam’s first time so it was even more exciting to show them around. The absolute best part of the day was visiting Ollivander’s Wand Shop, as I didn’t go inside last time due to the huge wait times. When we got inside, I was the lucky person chosen to participate and test out wands – it was amazing! 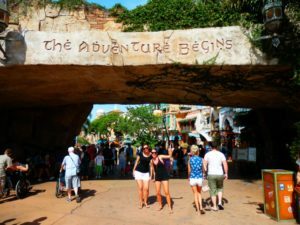 Orlando marked the end of our bus journey – over 4,000km worth of distance covered across the Mid-West and Southern states of the US for just $85 each. It was definitely a memorable experience, and one I’d recommend to anyone interested in travelling through the United States of America.